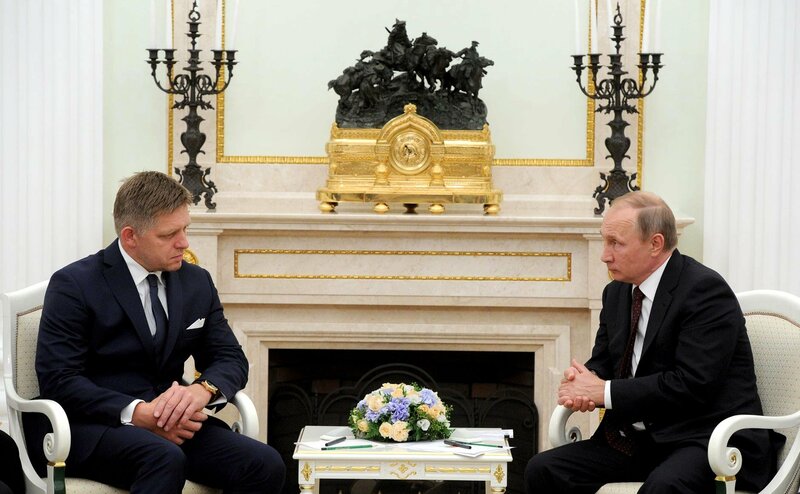 Robert Fico meets with Vladimir Putin in Moscow, Aug. 25, 2016. Slovakia’s Prime Minister Robert Fico once again spoke for lifting of the sanctions against Russia, as, he said, they are useless and harmful both for the European Union and for Russia. "My opinion is it is high time to consider the sanctions from the rational point of view and to say they are harmful both for the EU and for Russia," he wrote on his Facebook page. "They have not favored absolutely settlement of the problem, which they were supposed to influence." On Aug. 25, the Slovakian prime minister visited Russia, where he had a meeting with Russia’s President Vladimir Putin. On Aug. 26, Robert Fico will participate in a meeting of the Vysehrad Group (Hungary, Poland, Slovakia and the Czech Republic) with the German Chancellor Angela Merkel. "Yesterday, with Vladimir Putin we came to the common opinion that our purpose is to develop mutual trade," Fico wrote on his Facebook page. Presently, for the six-month period, Slovakia chairs the European Council. In the past, Slovakia’s prime minister several times spoke in favor of having the sanctions against Russia lifted. Fico said that his government is interested in correcting the current situation in the relations between the EU and Russia. According to him, Slovakia is committed to restoring full partnership and mutually beneficial cooperation between the EU and Russia. On June 14, Putin and Fico held a telephone conversation, which was also dedicated to the development of relations between the two countries. Presidents of Hungary and the Czech Republic are also against the sanctions. At the same time, Angela Merkel and the Czech Republic’s Prime Minister Bohuslav Sobotka on Aug. 25 called premature a possible lifting of the EU sanctions against Russia.